Arriving in the afternoon sunshine we gleefully navigated our rented convertible around hairpin bends and winding panoramic cliff roads like a James Bond car chase (just, y'know, in slow motion, brandishing guidebooks and with TWN Rental painted on both sides of our blue Fiat Punto Cabriolet). We found the lovely - and surprisingly affordable - Hotel Barsalini on the edge of the shore, at the foot of the island’s largest mountains, which are greenly carpeted with oak and chestnut trees and a riot of Mediterranean shrubs. The scenery is intense and soothing: crystalline water, dramatic rock formations and countless remote coves and inlets to be explored by boat – my favourite memory of the island. 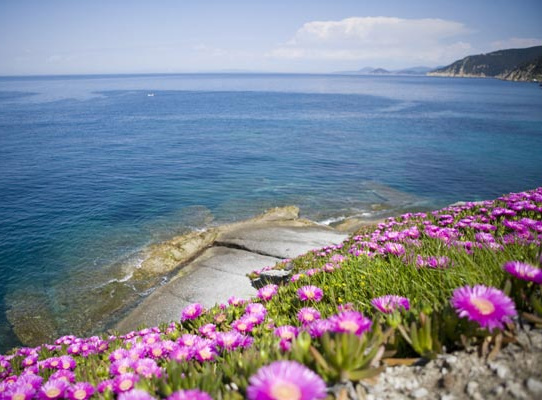 The weather was perfect and the air perfumed with the island’s wildflowers and the tang of the sea. So we tried to bring home the scent of the island through the local fragrance, Acqua dell’Elba, made with island ingredients like flowering shrubs, citrus and, apparently, even seaweed makes the mix. 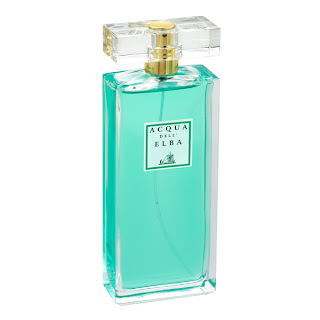 I fell hard for the eau de nil packaging and the bottles are lovely in their simplicity, but I’m a little wary of the perfume’s pale turquoise hue. Sure, it’s reminiscent of the sea, but do I really want to spray blue dye on my skin? But the fragrances themselves are lovely: I have the classic women’s version which is light, fresh and not too sweet. Himself opted for Arcipelago which is richer and more musky. Both remind me of other scents, so they’re not terribly original, but they conjure up memories of warm summer days and nights regardless. I would have learned more had I visited the lab where they’re made - but I didn’t. I also didn’t get to the small archaeological museum in Marciana, the cable car on Monte Capanne or Napoleon's former residence in Portoferraio - but that’s all ok with me. They wait to be explored on our next trip back. And until then, a spritz or two of my Acqua dell’Elba will take me right back in a heartbeat. Just love the look of that bottle...and that image of the water - lucky you! Looks beautiful and I never heard of the place before! Love the colour and Love the way you write! I love this perfume and would like to purchase it in the U.S.